Need to upgrade your system? 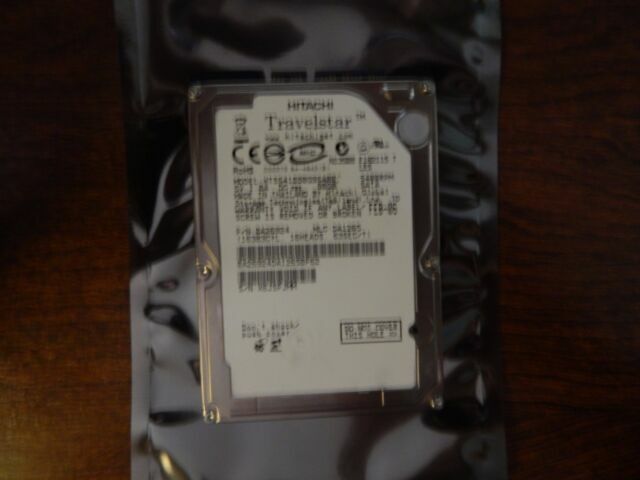 Get the Hitachi Travelstar 5K100 HTS541080G9SA00 internal hard drive that will perfectly suit your system. Get faster access to your data with the 12 ms (average) seek time of this Hitachi HDD. Data operations get a boost with the 5.5 ms average latency of this internal hard drive. With a buffer size of 8 MB, this Hitachi HDD virtually stores your data, so future requests can be served faster. Equipped with 1xSerial ATA-150 - 7 pin Serial ATA interface, the Travelstar 5K100 HTS541080G9SA00 hard drive offers more connectivity options. Perfect quality, fast working speed without errors. It doubled my memory,runs quietly.I only use for replacements in computers to sell.when it loads properly and runs quietly I usually do not see the lasting capabilities as the computer is sold shortly after install. I LIKED EVERYTHING ABOUT THE HARD DRIVE , POWERED UP NO PROBLEM I WAS ABLE TO LOAD XP WITH OUT ANY GLICHES AND ALL DRIVEERS .I ONLY THINK I WAS LOOKING FOR WAS TO REVIVE A FOUR YEAR OLD LAPTOP!!!!!!!!!!!!!!!!!!!!!!!!!! I WOULD LIKE TO TELL YOU IT IS GOOD,BUT,I HAVE NOT RECIEVED IT YET. (I PURCHASED IT BEFORE CHRISTMAS 2012)DO NOT EVER USE THE ROYAL MAIL.